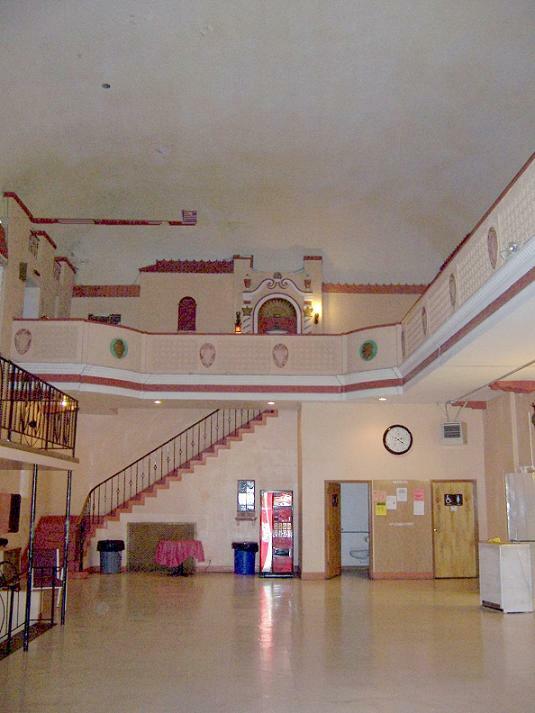 The Newark Gospel Tabernacle/Stanley Theater is a gem of a building that even many Vailsburgers don't know about. Architecture fans may notice that the Spanish facade is a little out of place on South Orange Avenue. More astute observers will notice the old theater marquee and deduce that what must now be a church used to be a theater. From the outside, no one can guess at the size and imagination that lies within. Come explore. The Newark Gospel Tabernacle is located at 985 South Orange Avenue, near the intersection with Stuyvesant, in Vailsburg. Click here for location. The enjoyment of movie going in the era 1910-1940 was more than just the pleasure of seeing a film. Movie palaces, like the Loew's in Jersey City, and atmospheric theaters like the Stanley in Vailsburg made the theater itself a destination. In the decades before World War II, rather than stadium seating and surround sound, movie theaters were palaces where Louis XIV would feel at home. Instead of being large sterile multiplexes of a similar mold, movie theaters were individualistic fantasies. If not Versailles, movie palaces could be Luxor, Angkor Wat, Teotihuacan, or the Forbidden City (eg, Grauman's famous Chinese theater in Hollywood). 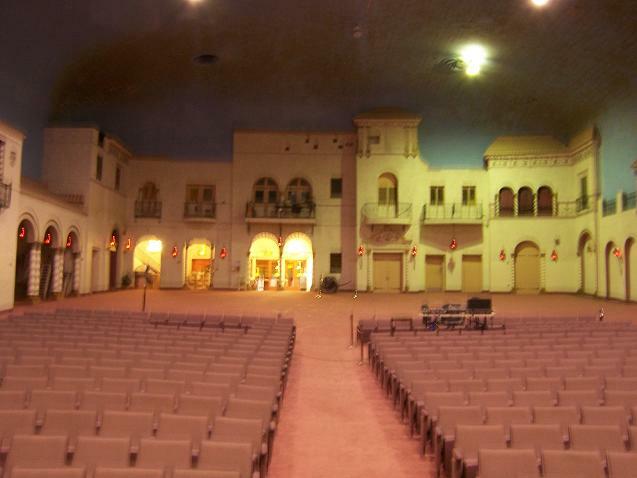 No one has built a movie palace or atmospheric theater in the United States for decades. This imaginative tradition lives on in one place, in my opinion, Las Vegas. The Stanley Theater in Vailsburg is more of an "atmospheric theater" than a movie palace. As we will see, while the Stanley Theater has its share of gilt, the Stanley overwhelms with imagination, not opulence. The Stanley Theater was built by the Stanley-Fabian theater chain in 1927. It was intended to be a theater for cinema only, not live performances. This theater in Vailsburg was actually the Stanley-Fabian chain's second in Newark, behind their flagship cinema on Branford Place (now demolished). What evolved into the Stanley-Fabian chain was founded in 1897 in Philadelphia by the Mastbaum Brothers. The chain was named after Stanley V. Mastbaum, but the more active partner in the corporation was Jules E. Mastbaum. At first the Mastbaums just operated nickelodeons, but in 1909 they founded the Motion Picture Company of America and in 1914 they opened their first Philadelphia movie theater. In 1926 the Mastbaums, whose company was renamed the Stanley Company of America, purchased the Fabian chain. Aside from managing his family's theater empire, Jules Mastbaum was a great Philadelphia philanthropist. His most famous bequest is Philadelphia's Rodin Museum. 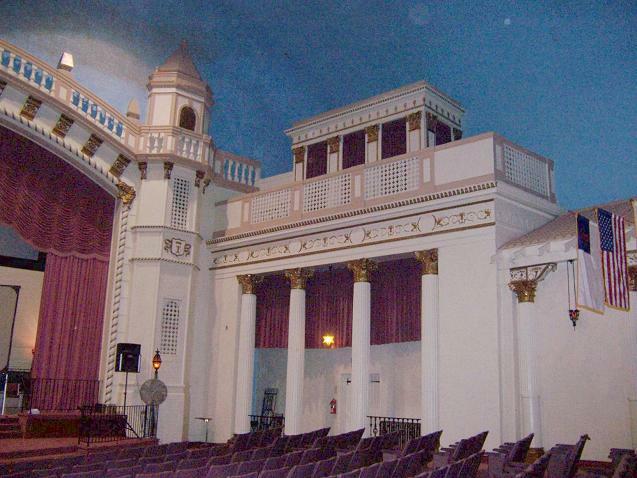 It was actually the Fabian half of the Stanley-Fabian chain that created atmospheric theaters like this gem in Vailsburg. The old Stanley theaters, like the one on Branford Place, were nice, but neither imaginative nor opulent. Jacob Fabian, a native of Paterson, New Jersey, pioneered exotic theaters in the Northeast. The Stanley Theater was designed by Frank Grad. Grad ingeniously designed the Stanley Theater so that one would walk through a series of three steadily more impressive chambers before coming to the grand main theater. 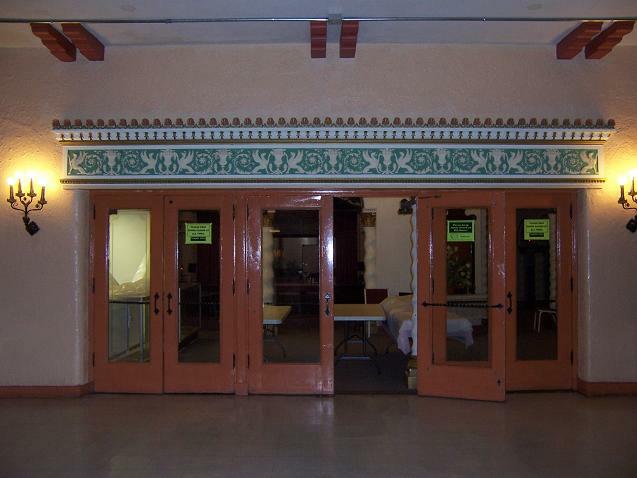 The entrance hallway of the Stanley Theater does not hint at the Spanish themed auditorium that lies within the building. This entrance hallway contains elaborate plasterwork of angels, putti, and flowers. Again, the effect of entering the Stanley Theater is of ascending from the gritty street to entering a fantasy. Seen here and above are two views of the Stanley Theater's waiting room. Theater patrons waited here before shows and during intermissions. Old timers remember that Stanley attendants always wore red velvet uniforms. 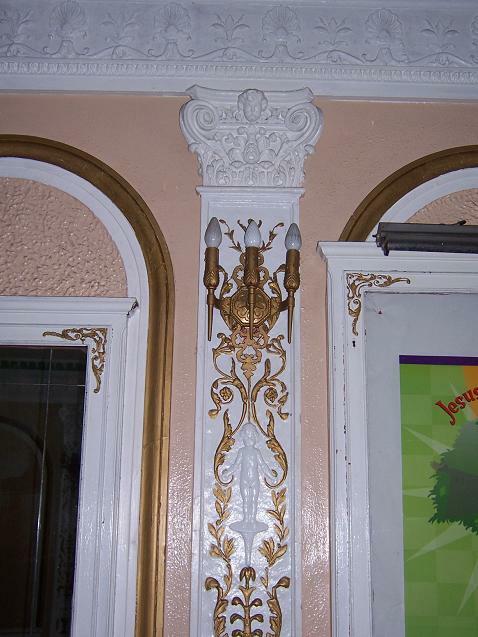 Frank Grad and his assistants incorporated a diverse range of decorative elements into the Stanley Theater, from heraldic emblems to putti to griffins. This is all a prelude though to the grand event of the Stanley Theater, the 1200 seat auditorium. After several forecourts, one finally enters the finale of Frank Grad's Vailsburg masterpiece, the main auditorium. The Stanley Theater opened in 1927 to rave reviews. The Stanley is the essence of Spain. It is a gem of architectural beauty, bringing in its exquisite conception the brilliant and haunting magic of Seville and Barcelona, all the glamor, all the color, all the gaiety of the romance-loving people of the southland of Europe is reflected in its architecture and this reflection has been admirably caught by those skilled in the crafts that built the theatre. Beauty of decoration and comfort are its main features. One views a program at the Stanley as if in Spain itself. There is an expansive cyclorama above the spectators upon which float fleecy clouds. The cloud-decked heavens are fretted with twinkling stars and the performance takes place as if in a Spanish garden directly beneath the Spanish stars. The atmosphere of the Stanley was enhanced by a special machine that reproduced clouds and twinkling stars on the darkened ceiling. The Stanley Theater flourished for several decades on busy South Orange Avenue in Vailsburg. Down the street was another theater owned by the same chain, the Mayfair. Over the years though, the Stanley became less viable as a theater. The Stanley was hurt by the relative decline of Vailsburg and changes in how people spent their leisure time. In the 1950s the Stanley was purchased by an Italian-American group to be the home of Casa Italiana, later affiliated with Seton Hall University. 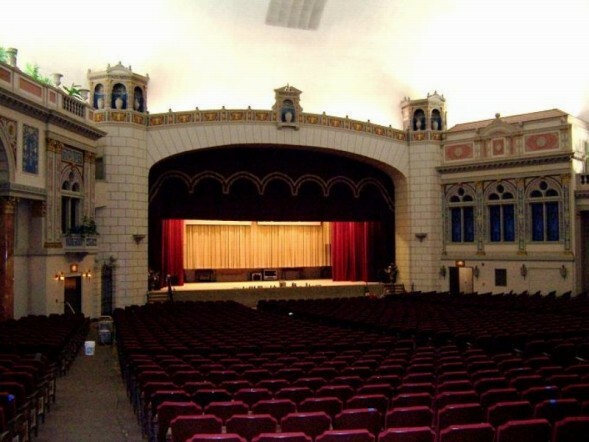 As Casa Italiana, the Stanley's Spanish architectural themes were preserved, but all of the seats nearest the stage were removed so that the auditorium could be used for balls. The screen was still used for Italian movies. 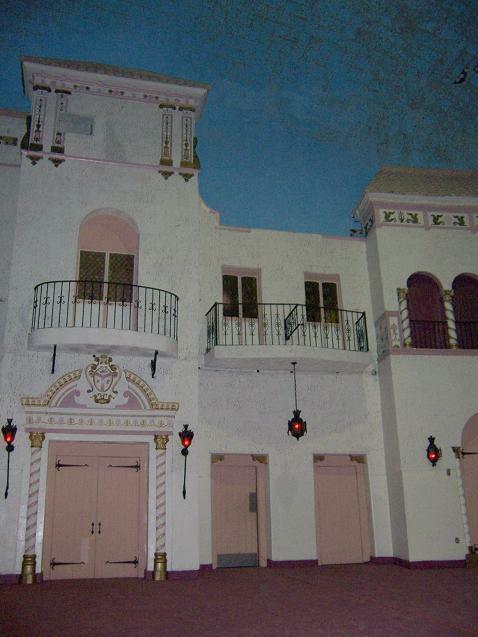 The Casa Italiana sold the Stanley Theater 1989/1990. The sale price was just over $1,000,000. The Casa Italiana, like several other Newark people and institutions, is now in South Orange. 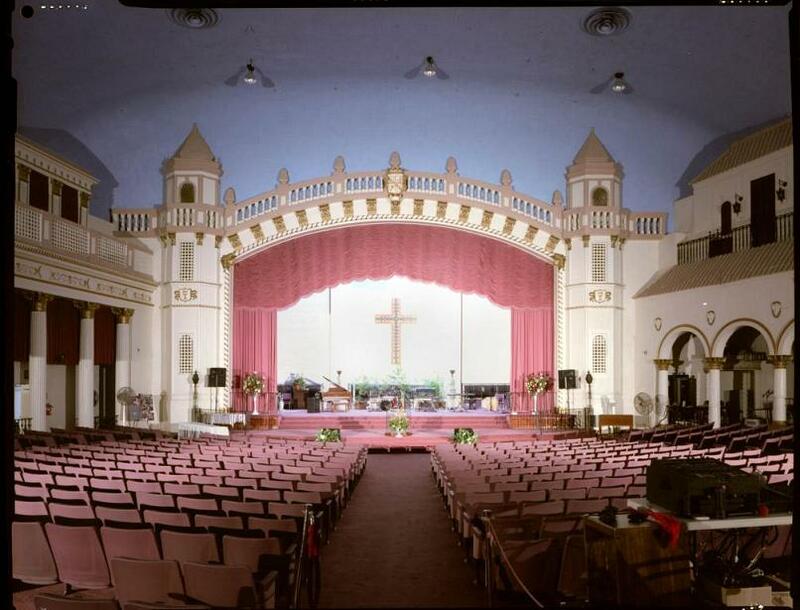 The Newark Gospel Tabernacle was founded in 1958 on 12th Street in the West Ward of Newark. 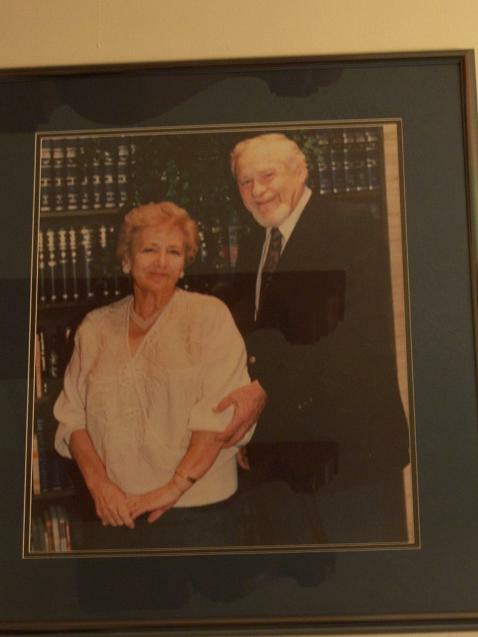 The founders, shown here, were Dr. Claire Hutchins and his wife. The Hutchinses came from New York City. The Newark Gospel Tabernacle has only had three ministers over the years. Dr. Aubrey L. Gregory has been minister of the Newark Gospel Tabernacle for 24 years. More Spanish scenes, notice the lamps. 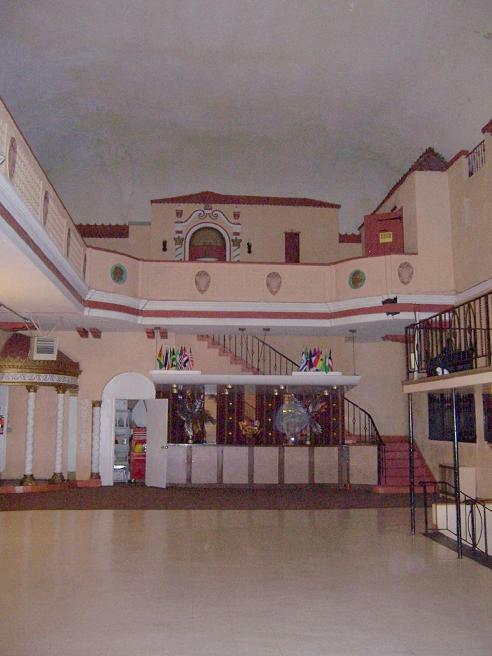 The Newark Gospel Tabernacle is proud of the former Stanley Theater. The church is keen on historic preservation and on bringing the arts back to Vailsburg. In addition to various social welfare services usually associated with a church, including services for the homeless on Saturdays, the Newark Gospel Tabernacle is trying to nurture an arts and culture scene in Vailsburg. 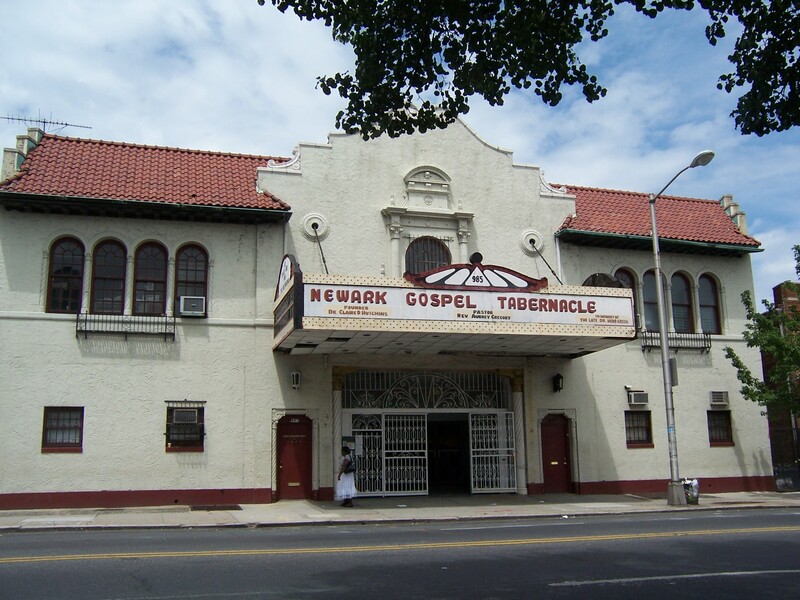 The Newark Gospel Tabernacle often hosts movies. As mentioned before, the Vailsburg Stanley Theater was part of a chain. Seen here is the larger Jersey City Stanley Theater, located at Journal Square. The Jersey City Stanley Theater was designed by Fred Wesley Wentworth in a more Venetian theme, but the architectural similarlities are easily apparent. The Jersey City Stanley was much larger than the Newark Stanley, with 4200 seats, versus 1200. The Jersey City Stanley Theater is now a convention center for the Jehovah's Witnesses, who maintain the theater with great care and who welcome visitors. Thank you to Dr. Aubrey Gregory for his assistance and for graciously allowing me to photograph the church.